tl;dr: “Artificial intelligence” and “machine learning” aren’t just airy industry buzzwords. The technology (and market impact) is very real. 2013’s Big Data is 2016’s Machine Learning (ML) and Artificial Intelligence (AI). AI and ML are the latest buzzwords, but unlike most corporate cliches, there’s a robust market for AI tech–both in the form of internal R&D and big corporate interest–in the realm of startup work and venture funding. But it’s taken a while to get here. 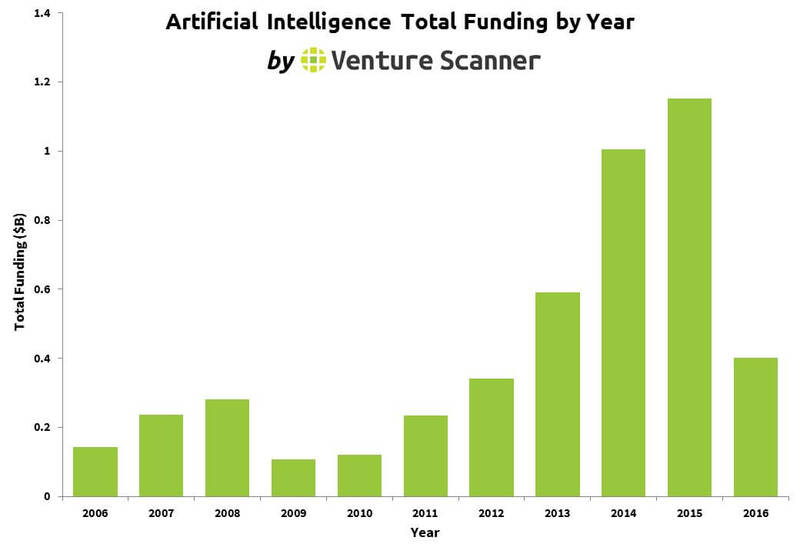 According to a report about investment into AI startups by VentureScanner, funding into AI startups nearly doubled between 2013 and 2015. While a lot of AI startups are being created, it’s more notable that there have been some significant exits in just the past month or two. There have been at least two big M&A deals on the software side. Apple acquired Seattle-based machine learning startup Turi for $200 million in early August. And just ten days later, Snapchat acquired Vurb, a search and natural language processing platform for mobile apps, for over $110 million. On the hardware side, Intel has gone on an acquisitions spree to counter Nvidia’s position at the top of the machine learning market. In August, Intel acquired deep learning startup Nervana Systems in anticipation of its 2017 release of the Nervana Engine, an application-specific integrated circuit (ASIC) designed to run deep learning algorithms very quickly. In early September, Intel also acquired Irish computer vision chip-maker Movidius with the goal of integrating their technology into Intel’s RealSense camera system, which will pave the way for Intel’s further push into the augmented reality (AR) space. Let’s back it up for a second. It’s important to keep in mind that what most people call “artificial intelligence” is a catch-all phrase. 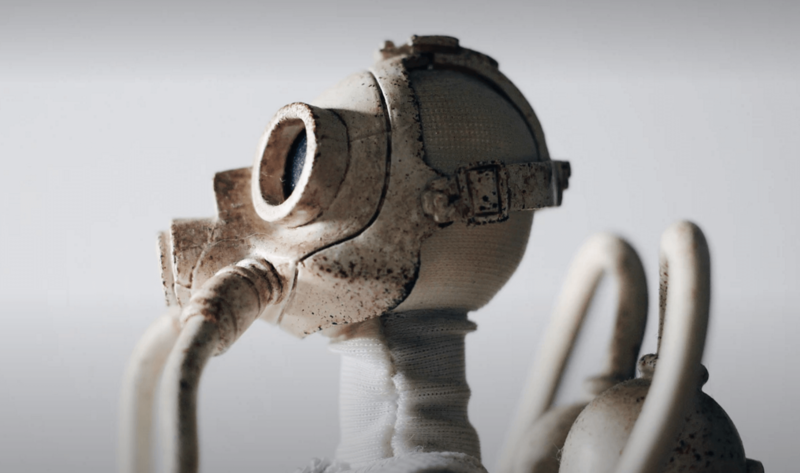 What most people refer loosely to as “AI” actually encompasses a number of subdisciplines in the broader field of artificial intelligence research. There are at least a half-dozen of these fields. Machine learning, genetic algorithms, speech processing, natural language processing, scheduling and optimization, and computer vision projects all fall under AI’s broad umbrella. No doubt there are other fields we didn’t mention here. In each of these subject areas, there are projects addressing specific applications of their particular niche technology, while others seek to advance the basic science of their field. It’s a deep and complex ecosystem, just like the problems these companies are seeking to solve. AI is a very hot market right now, but why? In order to answer this question, we reached out to Data Collective, a San Francisco-based venture capital firm that “invests in entrepreneurs applying deep compute, big data and IT infrastructure technologies to transform giant industries.” Data Collective’s portfolio includes Nervana Systems and Vurb, which we’ve previously mentioned, as well as Kaggle, a data science and machine learning education platform, and several other companies in the AI space. We spoke with Matt Ocko, cofounder and co-Managing Partner of the firm, about the recent interest in AI companies among investors and entrepreneurs. AI technologies presents an interesting case to those who study and work with emerging technologies. “We think there is both technology push and market pull,” Ocko suggested. The presence of both forces is rare in emerging technologies and creates significant demand. “Technology push” refers to the phenomenon of pushing a new technology out of the R&D lab and into the market. But up until fairly recently AI research had been a sleepy sub-field of computer science, exciting because of its promise to make machines think like us, but limited in real-world impact by theory, computing hardware, and the chilling effect of reduced government grant funding. In the last decade or so, due to huge strides in progress on the hardware and software side, AI technology is finally pushing its way out of research labs and into the market. Which technologies? For one, graphics processing units are ideal for running machine learning and computer vision algorithms, and the gaming industry has been the leading driver of developing ever-faster and less expensive graphics cards. On the software side, major university research labs and AI labs at private companies have pushed out open source libraries ready for use in AI applications, like Google’s TensorFlow project. It’s really difficult to estimate market size and impact of this technology because AI has pervaded so much of the global economy already. 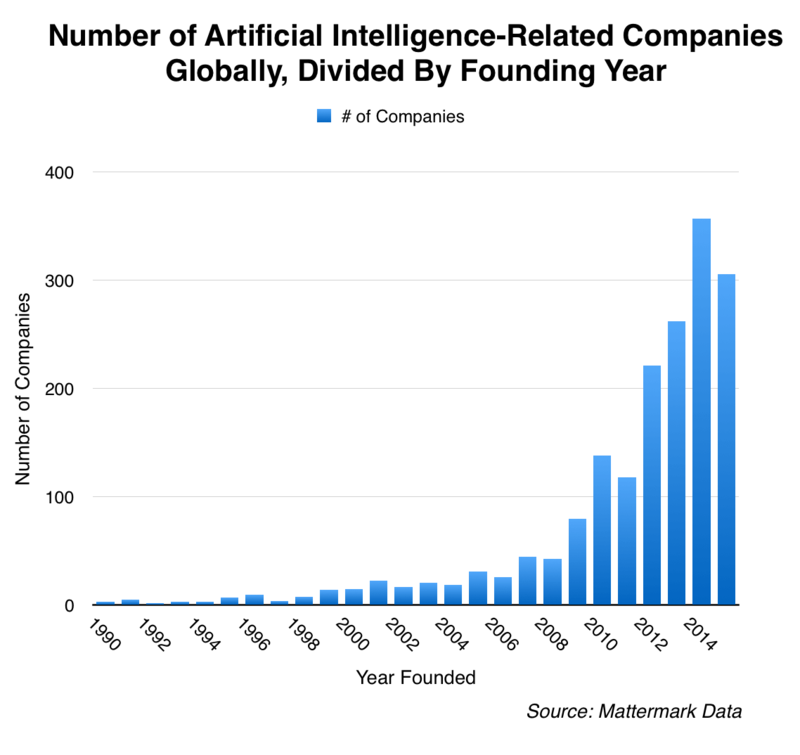 Although the field is still developing, AI has found applications in the financial system (in forms ranging from robo-advisors like Wealthfront and Betterment to fraud detection and high frequency automated trading), logistics, telecommunications and energy infrastructure management, healthcare and fitness monitoring, and consumer products and services. With billions of dollars flowing into AI from governments, private corporations, universities, and startup investors, there’s little doubt that artificial intelligence, machine learning, computer vision, and other related technologies will be a driving force for years to come. What’s exciting (and a bit scary for some) is that AI’s march across the economy, and it’s hard to predict the end game here. AI is a very interesting space. There are a ton of small niches to fill, and startup companies are jumping to the challenge of building the next great AI platform and application. Here’s a list of a dozen companies all using AI, ML, CV, and similar technologies to tackle a very wide range of problems. X.ai made Amy and Andrew, email personal assistants that use natural language processing to help users schedule meetings. Deepgram built a deep learning-powered platform that takes huge amounts of spoken-word audio data (like recorded phone calls) and makes it internally searchable by keyword. Motion.ai is a Chicago-based startup that created a platform for designing, training and deploying chat bots using a simple drag-and-drop user interface. Sift Science uses machine learning to detect and prevent fraud by monitoring over 16,000 fraud signals in real time for clients ranging from HotelTonight to OpenTable. DigitalGenius’s platform helps to automate customer service over chat, email and social media using natural language processing and advanced search. Deep Genomics uses machine learning to help transform precision medicine, genetic testing, and diagnostics using a computer system that mimics how cells read DNA and generate life. Amplero uses machine learning and “multi-armed bandit experimentation” to help marketers calculate and predict their customers’ lifetime value to client companies. Farmers Business Network sends analytics reports on metrics ranging from seed performance and agronomic practices to yield benchmarking based on 55 million acre-events of data processed with machine learning. BenchSci is an early-stage company building a deep learning engine to help researchers find the right biological compounds for their experiments. FoxType uses natural language processing and machine learning to help users write better emails. Wit.ai helps developers easily extract structured data from users’ voice and text data. Basically, it’s NLP as a service. Numerai is a new kind of hedge fund built on a global, anonymous artificial intelligence tournament to predict the stock market.